“Martin Luther King Jr. Day is not only for celebration and remembrance, education and tribute, but above all a day of service,” wrote King’s widow, Coretta Scott King. In Atlanta, where King pastored, volunteers will hand out energy-efficient light bulbs in low-income communities. In Chicago, where King lived briefly to draw attention to segregated housing, volunteers will package food for needy elderly residents and give coats to the homeless. In Memphis, Tennessee, where King was killed nearly 50 years ago, volunteers will pick up trash in more than a dozen neighborhoods. But to honor King mainly through benevolence is to overlook the civil rights leader’s commitment to the working poor. People today have a “fairly limited, sanitized view of King’s legacy,” said Marc Bayard, director of the Black Worker Initiative at the Institute for Policy Studies, a progressive think tank. While volunteers arm themselves with Hefty bags to wage war on litter, they should ponder some fundamental questions, Bayard said. “Why do these neighborhoods that have to be cleaned up — why are these the neighborhoods that have the higher rates of crime and higher rates of poverty? Why are these communities the target of redlining?” asked Bayard. In the last months of his life, King was consumed with plans for a multiracial Poor People’s Campaign. But on Feb. 1, 1968, two black sanitation workers in Memphis were crushed to death in a malfunctioning garbage truck. Not two weeks later, the workers went on strike to demand fair pay, benefits and union recognition. “The fact that he took time to go to Memphis, not once but twice, to be with the sanitation workers, showed his commitment to economic justice,” Bayard said. 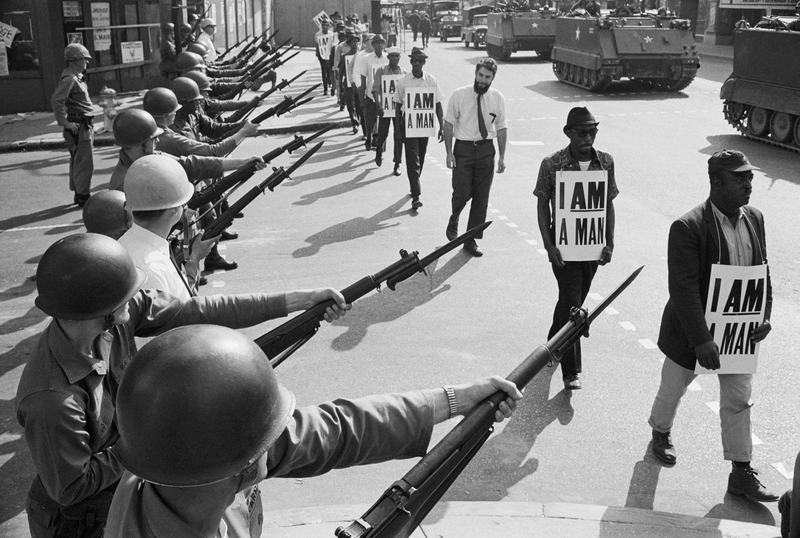 U.S. National Guard troops block off Beale Street as Civil Rights marchers wearing placards reading, “I AM A MAN” pass by on March 29, 1968. It was the third consecutive march held by the group in as many days. Rev. Martin Luther King, Jr., who had left town after the first march, would soon return and be assassinated. And don’t forget: The full name of the 1963 March on Washington is the March on Washington for Jobs and Freedom. It’s no mistake that these demands were racially inclusive. And it’s no accident that today, neither demand has been met, economic gains have been funneled almost entirely to the rich and the middle class is shrinking. By 2032, a majority of the working class – adults without a college degree – will be black and brown, according to a 2016 Economic Policy Institute report. Yet postelection explainers focus on disappearing manufacturing jobs in the heartland and the economic anxieties of the white working class. There is no path to national prosperity without public policies designed to help the most vulnerable, Blackwell said. Those policies, Blackwell and Bayard agree, include universal health care, higher minimum wages, reliable public transportation and union protections. So on Monday, feel free to beautify a neighborhood or feed the hungry in King’s memory. Then fight for workers’ rights to fulfill King’s dream.